Annnnd here's some more junk. Right after I posted the Legends picture, I found this one, on the listing for the "All Stars" line, which appears to be the basic 3&3/4" line (as opposed to the ASSemblers). Full pic after the jump. I don't even want to keep talking about how crappy these figures look. These are actually worse than the Assemblers, if such a thing were possible. Needless to say, I won't be buying these. And if this is all we're getting for a 3&3/4" line for this movie, then I'm afraid Hasbro has lost their minds. This is absolute garbage. You can find this listing at Entertainment Earth. My favorite part is the product description. What a joke. Edit by Brett X: Sorry Zak, had to throw something in for the Futurama fans. 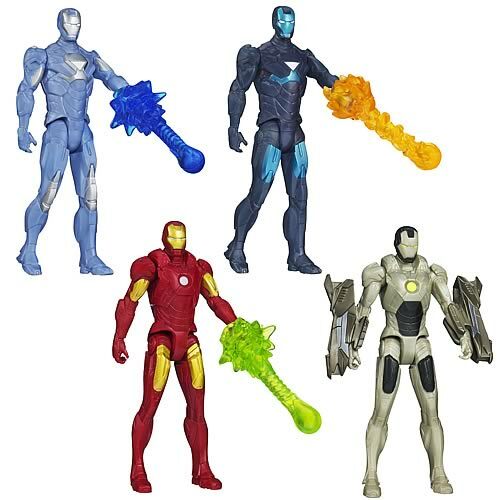 i mean, if these were like $3 tops, i might consider getting the cooler looking ones, just to display them on the shelf next to my other 3.75" iron man figs... buuuuut, since they're not gonna be... sorry Hasbro! gonna have to try harder than that! Don't worry. I can't see these things flying off the shelves at full price. I have a feeling you may be getting your chance for these in the $3-ish range somewhere down the road. 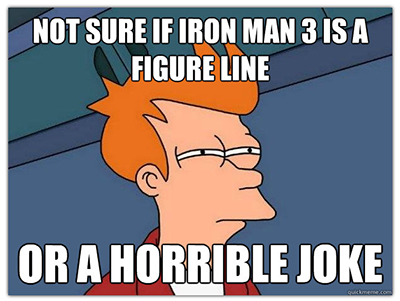 Good god, will there be no redeeming merch for Iron Man 3? "Absolute garbage", couldn't have put it better myself. Let alone articulation, where's the paint? I am actually also surprised there's no massive shooty weapons... Kids will gain 0 fun from playing with these, and I feel sorry for every kid who gets one bought for them, cos I bet they wouldn't choose to have them. Wow, Hasbro really taking a leaf out of Mattel's book right. Seeing the Avengers figures and the DKR side by side you could see who was the winner but it looks like it's even stevens now. I love the name 'All Stars' as well, that implies to me a who's who of the Iron Man film franchise yet we get vaguely movie Tony and 3 'concept' Tonys. The Spider-Man All Stars are no better either. Only 'good' thing about these are the nice effect parts. Well at least we know exactly who to blame for these tragedies. Soooo even lower quality than those Happy Meal toys they showed us last week, uh? At the very worst, I hope they can at least have the decency to make a proper figure of the new armour, similar to how the only decent figure from the Amazing Spider-man line was the screen version of the costume. I lol'd. More than I probably should have. Would love to call them out on this, but unfortunately, we're not on the invite list for Toy Fair. And it seems most other toy websites are more interested in kissing Hasbro's but than calling them out. I've been busting their chops on Twitter lately, but they of course don't respond. Oh well. We WILL be at SDCC, and I'll call them out there every chance I get. Thank you Zak. Honestly, I can get why they wouldn't respond to negative comments on twitter. Wouldn't want to start a flame war, then have people look down on them. Unfortunately, by SDCC they'll probably already be working on Thor 2 and Captain America 2 merchandise, with it being too far along to change anything. Yeah thank God we have u to represent us there, and at least their probably not making Gurdians figs yet.. Crossing my fingers and hoping these were used just for the pictures and not the final product, but given the rate these things are losing their articulation with each line coming out, I doubt it. Did Hasbro not pay attention to what happened with Mattel's Green Lantern line? Those things were as bad, if not worse than what these pics are showing now for IM3! Looks like we're stuck playing the waiting game 'til product hits stores. It will be fine as long as they do what they did with The Amazing Spider-Man and The Avengers, by giving us ultra poseable Spidey and Black Widow. Those were good figures. Sorry to be the bearer of bad news, but these are the actual IM3 line. There's also the ASSemblers line, which have the same 5 POA. Hasbro is not going to do 3 separate 3.75" lines for this movie alone when there are so many other Marvel movies coming this year. Plus, all the IM3 product has been showing up at retail for about a week now, and guess what? No surprise fully-articulated figures to be seen. Not seeing it, I'm afraid, given that, as I pointed out before, these are merely repaints of the deluxe figures and drivers from IM2/Avengers. The only actual (somewhat) screen-accurate IM3 figures we've seen so far are the Mark XLII and Iron Patriot in the Assemblers line. And you're not seeing a separate line of fully articulated figures either, are you? I'm aware that these are repaints of the Avengers driver figures. Welcome to Hasbro's new cheap-skate reality. These, along with the Assemblers, are the "actual IM3 line". If there were anything else coming, it would've shown up somewhere on the internet by now, with all the different Toy Fairs that just happened around the world (and the US TF coming up this weekend), not to mention the numerous leaks for these figures on ebay, and Hasbro's own PR announcements for both the All-Stars and Assemblers line a few weeks ago. Sorry dude, there's nothing else coming. At least not for the movie tie-in. At this point, I'm just hoping for some retailer exclusive multi-pack with decent versions of the movie armors. But even that is a thin hope at this point. I'll wait for the US Toy Fair before passing judgement. The only good thing to say is they have good replacment accessories for ones that my dog ate or I lost. If they can hold a GI Joe gun all isn't totally lost. We all have paid 3 bucks for a lost energy blast at least once. But 3 maybe 4 bucks is far more reasonable than 5 to 6 bucks plus tax.